I swear my walker isn’t part of my long-term food storage. With two mortgages, three kids in diapers, two kids in formula, and six mouths to feed (if you count the 100 pound dog), we now have zero income. No matter what political views you hold, we can all agree that this is a scary time. My husband is a pawn in this political chess game, and that means I am too. And so are my children. While I just felt angry and scared at first, my husband made me fall in love with him all over again when he came home that first unpaid day. He said something so kind and sweet about the situation, but I can’t type it here because it’s too polarizing. (This blog is my story, so I’m not about to throw Mr. Okayest under the political-view-bus.) Just pretend to swoon and feel better like I did. Having him home is wonderful. We can stay up late. He can actually finish his homework for once. I have two extra hands’ worth of help in a very hectic day. My day-to-day life is actually much better. There have been times when I have thought that having him home would be invaluable to me… and now is the time to put my money where my mouth is. Except I don’t have any money. How much is his help worth? How long will it be worth that much? The truth is, I just love to have his beautiful face around during the day. 1) Most of the free “food” is alcoholic drinks. Dang. 2) Most of the “free” food is just 10% off with a government ID. How exactly do they expect people to pay for the other 90% with absolutely zero income? Seriously, people! 3) Here is the best one yet: “Thirty percent off spa packages to furloughed employees.” Umm, if you are going to a spa while unemployed, you have some major problems. 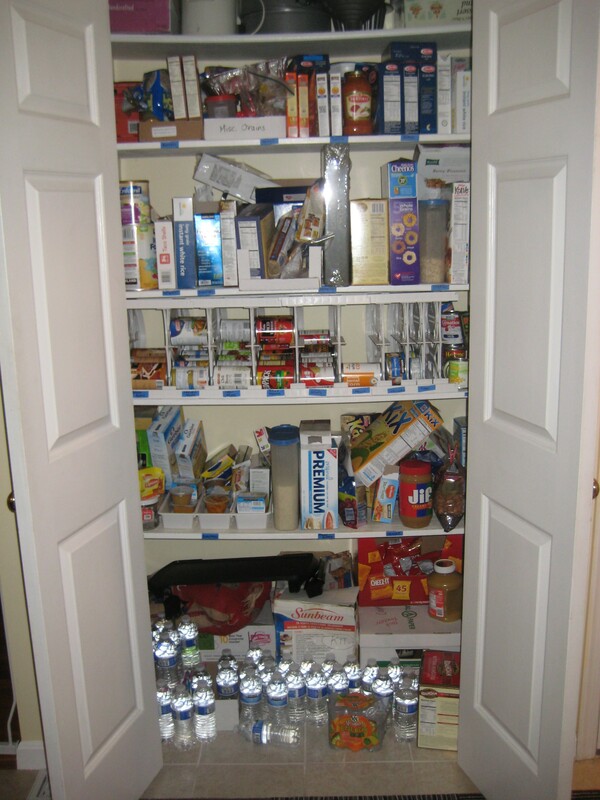 1) I am so thankful for my food storage. 2) I can’t believe I just sold my cloth diapers LAST WEEK. Idiot! I swear I tidied this short-term pantry for the photo. In addition to a three months’ supply of short-term food storage, we are also taught to aim for up to a year of what we call “long-term food storage”. This includes survival basics. I call it “under-siege food”. We are talking rice, wheat, beans, oatmeal, dry milk. Stuff that your kids would probably cry about if they had to eat. Our church does not promote doomsday scenarios or wild schemes you see on NatGeo about building a fortress with spikes and “keeping a box with crushed glass by the door for security” (that’s a Doomsday Prepper quote, folks!). Instead, we are simply taught to keep food storage for personal emergencies. If the husband were to lose his job or become ill, then at least that family wouldn’t have to buy groceries. What savings they do have could go toward the mortgage. We need to be self-sufficient in an emergency. How would you ever help “thy neighbor” if you can’t even help yourself? Our church also promotes having three months of your salary in savings, as well as two weeks’ worth of water storage. We follow these guidelines. We always have. I built our food storage over years, proudly canning much of it myself into large #10 cans with oxygen absorbers inside. I have a 72- hour kit packed and ready for each member of my family (including that dang dog), if we were to have to leave the home during any of the natural disasters that have occurred here, including earthquakes, floods, hurricanes, or trees falling. Political chess games require more of a shelter-in-place plan. I hope someday I can help our family be even more self-sufficient. I hope to grow food. I hope to have chickens and goats. (Hey, a girl can dream, ok? I owned a dog-walking business in a rural area, which meant that I mostly fed chickens, goats, and horses. I was good at it. I liked it.) It’s hard to do these things with three babies, but someday I will have three sons who can help. The trick will be to start when they are young enough to want to help, but old enough to walk and not put everything in their mouths. I want to tap into that “industry” phase of childhood before it’s too late. We will be fine. I know how to make emergency flat-bread out of a paste of flour and water and salt. (Although that does sound eerily similar to the recipe for homemade play-doh, now that I think about it.) I know how to cook without power. I know how to make my family poop in a bucket. I know how to … wait, those last two had nothing to do with furlough, did they? We will be fine. We don’t have any car payments because my husband is freakin’ MacGyver and can make anything work right. We don’t have any debt other than mortgages and student loans. We have savings. If things get bad, we know how to sell things. And how to market my MacGruber’s skills. We will be fine. We will not be buying the salmon, avocado, and blueberries on which my sons gorge. We will not be spending any gas money to visit the grandparents on the weekends. We will not be buying balloons or presents for the babies’ first birthday this week. However, we will be relying on our precious food storage and being thankful that we followed the advice of our church. Now if only I hadn’t sold those cloth diapers. Argh. By the way, I’m not claiming to be any kind of expert on 72-hour kits or anything else. I just really like to try. ” Stuff that your kids would probably cry about if they had to eat.” Hahahaha! So true! Except I would cry too if I had to eat that stuff for very long… Here’s to hoping you don’t have to dig into the long term supply! I’m LDS too. Seeing how prepared you are makes me want to get my things together! I will have to pack a 72hour kit for baby now, which is pretty exciting! 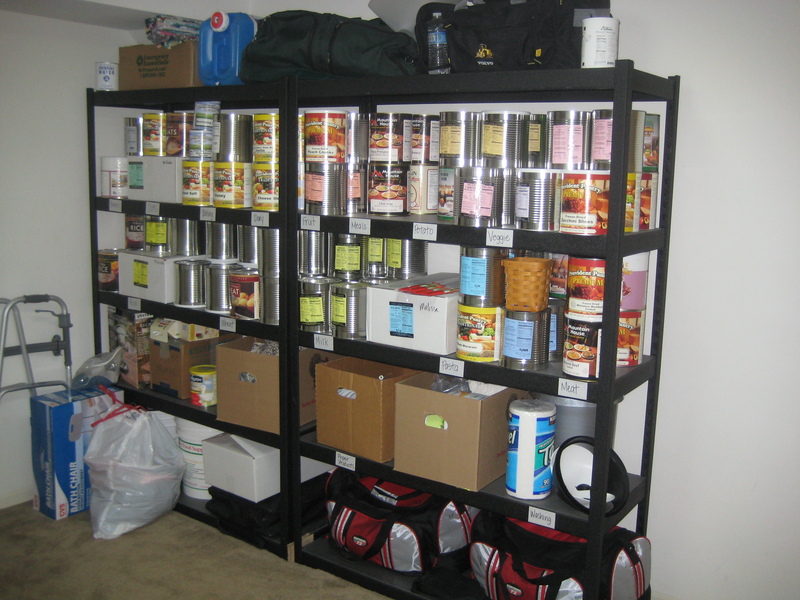 I think you have done an amazing job with your food storage and general preparedness! I’m glad you’re prepared – hopefully this won’t last too long! Lots of luck, “Okayest”. I hope this will end soon. You sound really well-prepared. I wish you were closer, we could share a meal or two… All the best. What’s your advice for newlyweds? I’ve been stocking slowly but surely. Did you check out my links at the bottom of the article? There’s also a handout there that I made about creating a 72-hour kit. As for food storage, my best advice is just to start by buying a little bit extra each grocery trip. You could decide to allot $5 extra per trip or something. So, if you usually buy 1 can of diced tomatoes, buy 6 cans that week. Just start small by buying a little extra at a time of what you normally eat. Does that help? Yep! I just get so discouraged because I’m still learning how to cook and don’t know how to cook with most dry storage items. Make a list of the meals that you DO know how to cook, and just make sure that you have the ingredients on hand to make those meals several times over. Like, if all you can do is spaghetti and tuna casserole, make sure you have lots of cans of tuna and lots of jars of sauce and lots of noodles, you know?